Farmers are angry at government plans to make them pay a levy towards the cost of dealing with animal diseases, such as foot and mouth and bird flu. Ministers want to set up an independent body to oversee policy by 2012 and say it is "right" that farmers contribute. It cost the taxpayer £44m last year to prevent and prepare for outbreaks. National Farmers' Union president Peter Kendall described the proposal, which would force the industry to pay half that bill, as "outrageous". 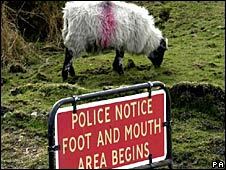 The Department for Environment, Food and Rural Affairs (Defra) says it wants to ensure funding is in place to reduce the risks and costs of diseases such as foot and mouth, bluetongue and bird flu. The proposals would set up an independent body, made up of experts in public and animal health along with people with industry or wildlife knowledge. In the event of an outbreak, its leaders would make key decisions on issues such as movement controls and payments for culled animals, on the advice of the chief veterinary officer. It would also be responsible for policy on endemic diseases such as bovine TB. Mr Kendall said he was "furious" - given that the probable source of the 2007 foot and mouth disease outbreak, which he said cost the industry more than £100m, had been identified as a government laboratory. Investigators concluded the virus had probably escaped from a drain at the government's Pirbright labs in Surrey, forcing livestock movement restrictions to be imposed. "I find it incredible that ministers can suggest that, in future, livestock farmers should pay half of the government costs for an incident like this," said Mr Kendall. "[Defra] wants us to pay for exotic disease but we don't think they do enough to keep these diseases out of the country. "Farmers will be dismayed by these proposals and they have little confidence in Defra on animal health issues." Mr Kendall said the industry was losing millions of pounds because of bovine TB, which was reaching epidemic proportions in places and had wiped out more than 30,000 cattle last year. However, he gave a cautious welcome to any independent body which was a "genuine partnership" between farmers and the government. Environment Secretary Hilary Benn said the government spent £400 million per year on animal health and welfare and that costs rose during outbreaks. "Livestock owners are worst affected by disease outbreaks and they also benefit from disease control, where their livestock might otherwise become infected," he said. "It's right that they should be more involved in making decisions about how we prevent and handle those diseases, and contribute to the costs of collective action to tackle disease threats." The government says the proposals are in line with recommendations made by Sir Iain Anderson's inquiry into the foot and mouth outbreak of 2001. He said those who benefit from wiping out such diseases should help to pay the costs of eradicating them.